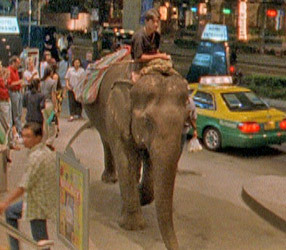 An urban elephant roams the streets of Bangkok, Thailand. On the streets of Bangkok and other large cities in Thailand, unemployed and homeless Asian elephants are becoming a common — and controversial — sight. While some of the animals are popular tourist attractions, with mahouts selling bananas or bags of food for a few cents to passers by, many are considered nuisances that threaten pedestrians and snarl traffic. 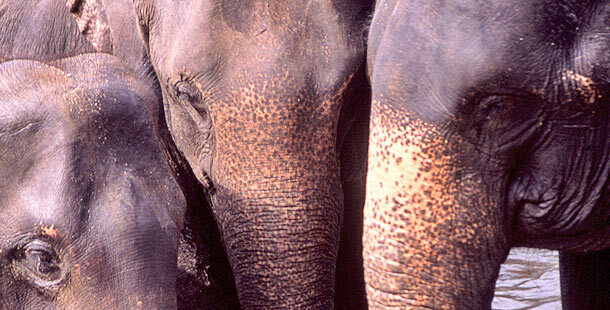 Many mahouts, however, say they have little choice but to bring their elephants to the big city. The spread of farm machinery and limits on logging have reduced the demand for elephant laborers, forcing the mahouts to find other ways to make a living during some seasons. One of the best options, they say, is using the elephant to attract donations along a busy city street. An urban elephant roams the streets of Bangkok, Thailand. Thai officials frown upon the practice, and have passed laws banning elephants from roadways. But the mahouts say the laws have little effect. “We know that walking elephants on the streets is illegal, but we have to, otherwise neither us nor the elephants would have anything to eat,” one told the BANGKOK POST a few years ago. Even the periodic fine isn’t enough to scare the mahouts away. But life in the big city can be dangerous. Some elephants are hit by cars. Others are abused by children. And recently, the POST reported that one elephant broke its leg after stumbling into a storm drain. The accident dashed the hopes of the elephant’s mahout, who had hoped to make enough money parading the animal through the streets to pay off a debt. His dream dashed, he could only wait as his elephant’s leg healed in a local animal hospital. Whatever Happened to Shirley and Jenny?